The newsletter has been corrected (broken links in the email version) and spelling. thanks for Laura and Mark for pointing out. Next meeting is next Tues. Agenda is Denise DeRose on turning purses. See this page for more details. There are two requests below for feedback, which have been almost totally ignored in the past 2 weeks. I would suggest to the members that this feedback is useful and needed if you want your voice to be heard. Jim Laflin started off the panel of 5 topics with a rendition on drying wood. There is a great list of techniques on the website for drying. 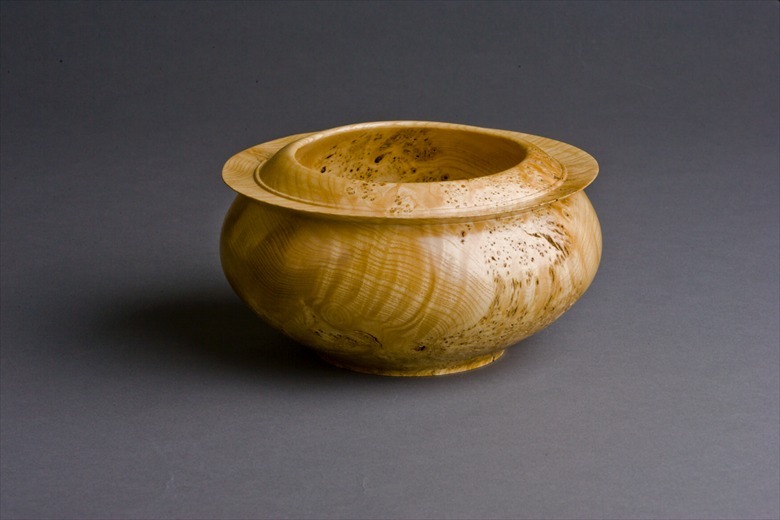 Jim did add the description of boiling the Madrone burl rouged bowls for several hours and great results that came from that process. Seems to be quite effective for something as temperamental as this kind of burl. Other tidbits are that woods like Black Acacia should not be turned dry as they are very hard "like ebony" Jim mentioned. Barry Uden next discussed the cutting of wood and gave a quick demo on an electric chain saw. He also had a good piece of wood that he had cut up into several turnable pieces. Good pointers. Tom Haines was up next talking about the cutting of wood in prep for turning. He had a series of tips for the use of the bandsaw, so ask him if you did not hear the details. 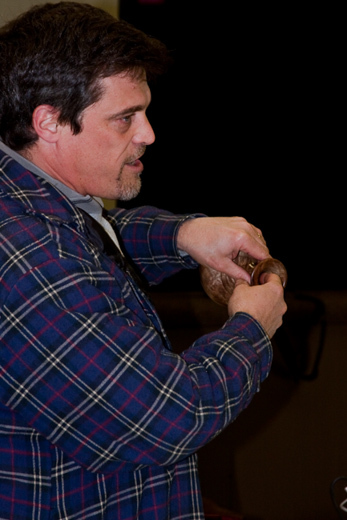 David Vannier delved into the different mounting techniques for securing the wood on the lathe. Using a face plate for wood over 14in was his advice. Using solid screws to mount the face plate is key. Square head screws from Craft Supply. Terry Gannon next discussed the insanity and joy of doing coring. It is a good way to save wood and the making of chips. It does however require care to be safe and to have tenons as large as possible. There seems to be some interest in seeing more in the future on coring with an equal number having had experience with coring. The McNaughton system gives great control and a need to learn how to control the beast while most use the One Way system. There were a number of folks who brought items to the meeting for presentation. Pres Challenge was jewelry, Harvey Klein with a necklace, Howe with tops for Pipe (picture at left), (Peter Pipe has delivered over 1500 tops to the RM Center - amazing work Peter. ), Curtis Vose with a disk on a chain, Peter with turned small spheres on a chain, George Lutz and Richard Winslow with bracelets, and Lonnie with a necklace. Show and Tell gave Tom Haines a chance to show a inlaid plate (picture nearby), Bob Tang with a very interesting juniper bowl more nature than bowl. Bill Anderson had a 2-axis candle stick holder. There is a new poll on this meeting on the website that provides good feedback. See this link and add your 2 cents. The next meeting will be at Los Altos LACY (I will send out a reminder) on Mar 8th at the usual time of 7PM, and will include another unique agenda. The issue of Turning 25 piece from the Club must be resolved at this meeting, while the Collaboration continues to be driven admirably by David. First of all the President's Challenge for March will be turned piece from a piece of wood that challenged you. April's challenge will be some form of spindle turning. Secondly the main agenda item will be a demonstration by Denise DeRose on wood purses (picture at right). More details are on the club website. See this link to more background on her. The newly formed Program Committee is off and running, having had their first club meeting. Look for some discussion on texturing and surface decoration in the April, May meetings. They are asking for your input on whether or not you have any specific interest and if you would be a part of a demo team or panel. Do see this page to add your comments and suggestions. This committee is comprised of Claude, Grant Allison, Curtis Vose, Laura Mulligan, and Tom Haines. Their charter is to come up with ideas for future meetings, and they are off to a good start. This committee has a lot of energy and purpose, so do give them support and input. For a job well done and done with a lot of time and effort on both of their parts. The copious pieces of walnut there for the taking were most appreciated. There are as large as advertised, and I hope their backs are all in good shape. Demo on March 13th, see homepage for details as they occur. Place is the activity center in Los Altos. Laura posted a document on Yahoo Groups. See the website homepage for links. Also keep your eyes open for some wood for this is the time of year when the trees come down. Dues for 2011 are now overdue. Late fees are being charged. New annual dues are $30 plus the $5 late fee. It is important to be counted and to contribute, for the activities in the club depend on these funds. There are also good reasons to join AAW. See our website for details and a link to AAW and to a video. Plenty of shirts are now available, so let Ross know of your purchase plans so he does not have to carry the stuff to every meeting. Jim was honored at the Christmas party for his special contributions to the Club. He was given a fabulous bowl turned by Barry Uden, and also given lifetime relief on club dues. He has been tireless in his support of so many activities over the years, being one of the founders, his energy has lead the club to the point we find it today. I am making mention in the newsletter as many were not at the Christmas Party. Also for new members, you will seeing more of Jim, as he is gracious in hosting many events at his shop, including the summer BBQ. So pass on your congratulations in person.